29-year-old Dr Theodora Hawksley, who is training to be a nun with the Congregation of Jesus. The number of women entering convents in England and Wales has hit a 25-year high suggesting that religious life is an attractive choice for an increasing number of educated and dynamic young and older women. Both enclosed or contemplative and apostolic orders are on the rise in terms of numbers. There has been a nine-fold increase in the number of active religious sisters and a four-fold increase in the number of enclosed sisters in England and Wales. 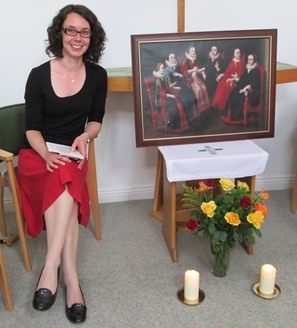 Theodora Hawksley (29) was until recently a postdoctoral researcher at the University of Edinburgh. She joined the Congregation of Jesus a couple of months ago. She is now living in their house in North London and is taking the first steps towards making vows of poverty, chastity and obedience. “Entering religious life was a decision born of love. It was an acknowledgement that my life has slowly and concretely rearranged itself around the love of God, and around that relationship as the one I prize above all else,” she said. The Congregation of Jesus is an apostolic order working outside the cloister in a wide variety of different fields such as education, healthcare, evangelisation and more besides. The Superior General of the Congregation of Jesus is Sr Jane Livesey. Mary Ward’s vision of an active, apostolic role for women in the Church met with opposition during her lifetime, but it finds an echo now in Pope Francis’ call for women to play a more ‘incisive’ role in the Church. Sunday 26 April is Vocations Sunday – a day of prayer for vocations to the priesthood and consecrated life.